Finally, Harris stumbled upon an effective way to rein in that voice, something he always assumed to be either impossible or useless: meditation, a tool that research suggests can do everything from lower your blood pressure to essentially rewire your brain. 10% Happier takes readers on a ride from the outer reaches of neuroscience to the inner sanctum of network news to the bizarre fringes of America’s spiritual scene, and leaves them with a takeaway that could actually change their lives. Startling, provocative, and often very funny . . . [10% HAPPIER] will convince even the most skeptical reader of meditation’s potential. 10% HAPPIER is hands down the best book on meditation for the uninitiated, the skeptical, or the merely curious. . . . an insightful, engaging, and hilarious tour of the mind’s darker corners and what we can do to find a bit of peace. The science supporting the health benefits of meditation continues to grow as does the number of Americans who count themselves as practitioners but, it took reading 10% HAPPIER to make me actually want to give it a try. An enormously smart, clear-eyed, brave-hearted, and quite personal look at the benefits of meditation that offers new insights as to how this ancient practice can help modern lives while avoiding the pitfall of cliché. This is a book that will help people, simply put. This brilliant, humble, funny story shows how one man found a way to navigate the non-stop stresses and demands of modern life and back to humanity by finally learning to sit around doing nothing. A compellingly honest, delightfully interesting, and at times heart-warming story of one highly intelligent man’s life-changing journey towards a deeper understanding of what makes us our very best selves. As Dan’s meditation practice deepens, I look forward to him being at least 11% happier, or more. 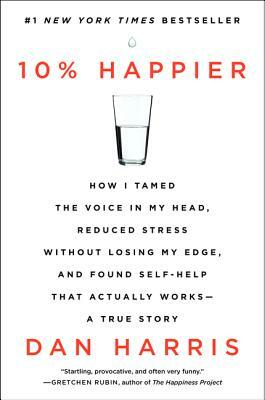 10% Happier is a spiritual adventure from a master storyteller. Mindfulness can make you happier. Read this to find out how. Part-science, part-memoir, and part self-help, Harris outlines specific ways he learned to, well, chill the f#%k out. Revealing . . . I’d recommend this to anyone. Harris never loses his sense of humor as he affably spotlights one man’s quest for internal serenity while concurrently navigating the slings and arrows of a hard-won career in the contemporary media spotlight. Friendly, practical advocacy for the power of mindfulness and enlightenment. Harris’s journey of discovery brought back lessons for all of us about our lives, too. Nightline co-anchor Dan Harris is an unlikely ambassador for mindfulness, but his new book . . . might be just the thing that gets people to unplug and recognize that all this multitasking is making us miserable and unhealthy.